I have no idea what just happened. I was doing a pretty decent job of posting regularly, then … I dunno. I just didn’t. Anyway, I left off all squee-excited to start Crossfit. I made it through the fundamentals series, and had my first real class on Sunday. And I am still sore. It’s awesome. The fundamentals series is divided up into six classes over two weeks. It’s designed to introduce you to all the common exercises,proper technique, and general class format so you don’t walk into a class, get super confused, then totally kill yourself and blow out body parts. I was one of three women in my class, and it was comforting that we were all pretty similar in life status and goals: all moms of littles looking for fitness in a challenging, positive environment. 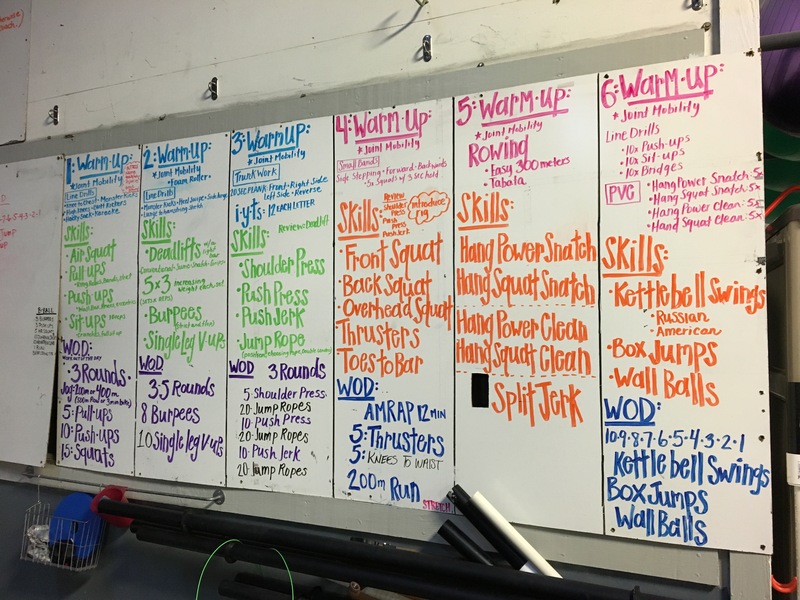 Every class consisted of a group warm up, some technique work, and a daily workout of the day, or WOD. I was impressed on how structured the programming is. The series send me along a spectrum of emotions and challenges. I have always been the type where if I don’t pick up something immediately, I get really frustrated really fast. Needless to say, the double-unders (jump rope where the rope goes around you twice – remember those days back in elementary school gym class?) were my worst day ever. But for the most part, I loved the heck out of everything else. Power snatches? Yes, please! Bring on the burpees! Hey, let’s go do pull ups! But I did struggle with wall balls on the last day because I slept weird again and pulled something in my neck/shoulder making it impossible to throw the ball while looking up at it. So I did what I could and called it a day; my legs were totally trashed by day 6 anyway! I had to modify a bit since I still don’t know what I’m doing and am not strong enough in some areas. I used a junior bar for the squats (15kg) because I am still working on my form. I’ve only done back squats my whole life, and my chest/shoulders are really tight from my computer jockey job. As the workout progressed I felt more confident in my technique, so next time I’ll use the women’s bar (20kg). Also I’m not strong enough to do toes-to-bar yet (when you hang from a chin-up bar and pull your feet all the way up to the bar – hence, toes-to-bar) so I modified with pulling my knees to chest. I still need to work on stabilizing my body so I don’t start swinging all over the place, but it’s a fun move for me so I enjoy having something to work on. I’m going to start Crossfit in some weeks and I’m a bit scared but still very positive 🙂 your post is very inspiring and motivational! Thank you, hope to do a good job myself! Yay, you’ll do great! Don’t be afraid to reach out to people; everyone was a newbie at one point and remembers their first class. And when it’s over it’s the best feeling ever! Thanks for stopping by!